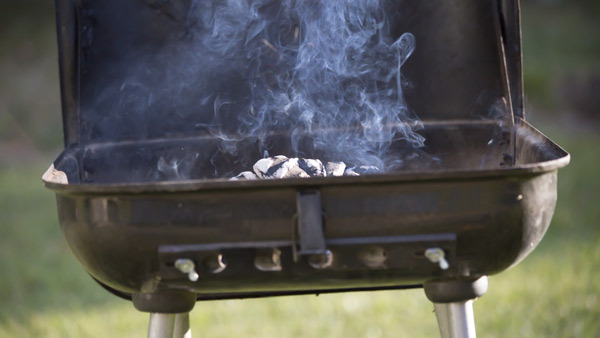 Connecticut fire officials say a man fell from a roof and became impaled on a barbecue grill rotisserie stand, seriously injuring himself. Crews were called Tuesday morning to the Danbury social club, where authorities say a man fell about 10 feet (3 meters) and landed on the metal object. It punctured part of his chest. Witnesses tell The News-Times that the man had been inspecting an exhaust fan on the roof. Authorities say responders used a saw to cut the beam off the grill while paramedics kept the metal in the man's chest so he could be taken to the hospital. The man in his 30s will undergo surgery to have the object removed. A safety specialist with the Occupational Health and Safety Administration was at the scene.